Nose Bettter Sooth Gel 0.46 oz. 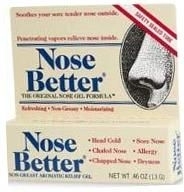 Nose Better Non-Greasy Aromatic Relief Gel soothes your tender nose outside. Penetrating vapors relieve nose inside. Refreshing, Non-Greasy, Moisturizing. Head Cold, Sore Nose, Chafed Nose, Allergy, Chapped Nose, Dryness. Apply vanishing gel around nostrils and under nose. Gel may be placed in nostrils to help relieve dryness discomfort. Use as often as needed. Note: Some individuals (especially children) with sensitive skin may experience an initial warm tingling feeling. This is perfectly natural. An immediate second liberal application of the gel has been observed to turn warming to cooling. For external use only. Keep away from children. Avoid contact with eyes. If conditions worsens or does not improve in seven days, consult a physician immediately. Active Ingredients: Allantoin 0. 5%, Camphor 0. 75%, Menthol O. 5%. Inactive Ingredients: Water, Propylene Glycol, Carbomer 940, Tocopheryl Acetate (Vitamin E), PPG-12-PPG-50 Lanolin, Glucose, Glucamate, Fragrance, Methylparaben, Eucalyptus Oil, Diisopropanolamine.